Apparently, at one time the Iverson Movie Ranch was over 600 acres, they filmed 2,000 or more movies or serials there, and it sat right across Santa Susana Pass road from Spahn Ranch. This is part on an aerial photo/map from 1952, it should be "expandable". Notice the hairpin curve in Santa Susana Pass road in the bottom right corner marked "railroad tunnel". Also, notice the rocky hill that's labeled near the bottom left corner as "Garden of the Gods". This is a larger version of the same 1952 aerial photo of Iverson. Just about in the center of the photo is probably the rocky hill with trees, the Garden of the Gods section of lower Iverson. At it's base, is probably Santa Susana Pass Rd. If you follow the road to the right, the hairpin curve with the rail line/tunnel is visible. 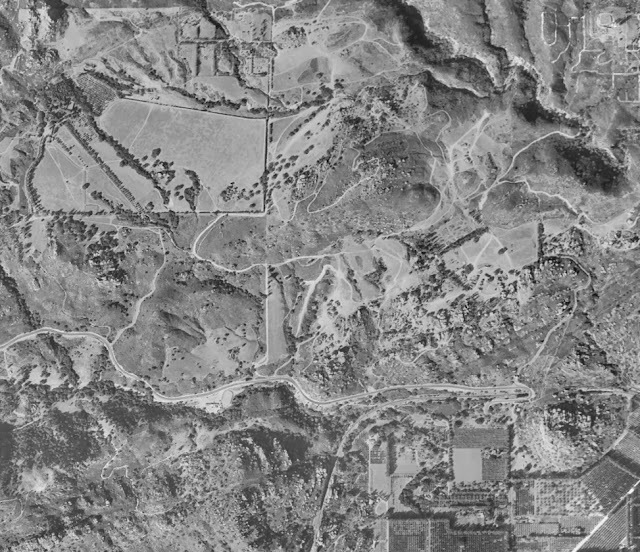 If you follow the road to the left, what is probably the oval shaped horse corral and "western town" that would become "Spahn Ranch" in 1953 is visible. In 1947, Lee and Ruth McReynolds purchased 55 acres of property from Dr. Atkins. Lee built some movie sets (a western town) next to his Trading Post on this property to catch some overflow from the very successful Iverson Movie Ranch. In 1953 the 55 acres was sold to George Spahn and became known as the Spahn Ranch. George Spahn added more sets and rental horses and it became a popular location for horseback riding among locals." Thanks Sunset.....fantastic set of photos. I was struck by the two photos of the horse powered farming equipment. One photo had a twenty horse team and the other closer to thirty. I've never seen that many horses hitched up before. Chicken thieves and others caught trespassing these premises after dark will be shot without further notice. It's very obvious looking through the historical fotos that California was a magical place back in the 20th century. Time and time again I have read while researching the 60s pop culture about the "dominant racist establishment" and how 1950's America was a "grey period" that the Hippies grew up in. If you will notice in these fotos also that California was developed by Christians, whether Catholic or Protestant. These church-going people loved America and California. Late in the 20th century a new breed of people moved in determined to destroy what those folks had built. These historical fotos prove that this "new breed" was lieing about America and determined to destroy it. The Hippies were lied to and their experiment failed violently. The Hippies were the children of America's most patriotic generation. The Hippes were America's most spoiled generation. However, the same "new breed" that lied to the Hippies is still here and still lieing and still trying to destroy what is left of America. Why do they want to destroy America? Because they hate Christians and they want to be in charge of them. Thanx for the comments, I didn't think anyone would even look at those old photos. I liked the one of the Reseda Drive In because I used to work in a drive in. I liked the one with "Miss Van Nuys" on the step ladder also. Probably the most famous rock at Iverson was the "Lone Ranger Rock". It can apparently still be seen from Red Mesa Road in or near the Cal-West housing development. Pic HERE. It can also be seen in those thrilling days of yester-year HERE. Finally, that Santa Susana Pass Road must have been pretty important and dangerous at one time. I read it started as an animal trail widen slightly by "Indians" hunting the animals. When stagecoaches went down a particularly steep section called "devils slide", the driver would blindfold the horses and make the passengers get out and walk, sometimes carrying rocks to chuck the wheels. That's why that piece of rail line behind Spahn Ranch became so important. Passengers and cargo could be carried much easier in rail cars, than on horse drawn wagons. I think there were 3 tunnels built, that one that runs under Santa Susana Pass Rd. and Topanga Canyon Blvd. might be "Southern Pacific Metrolink-Ventura Rail Tunnel #28". I'm not 100% positive though. Stoner Van Houten recently did this youtube from Shorty Shea's murder site beside Old Santa Susannah Pass Rd. In the video you can see Lone Ranger Rock from where Clem buried Shorty. Perhaps Shorty would have rested in peace easier if they had just left him buried within sight of the rock? 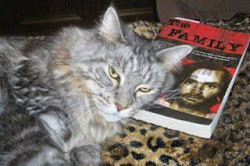 After reading Chris' recent thread on Kittie Lutesinger I have to wonder if Kittie and her big mouth aren't responsible for Shorty being murdered? Lone Ranger Rock is visible at 4:50 in Stoner's video. Anybody care to pontificate on Shorty Shea being murdered for what Kitty Lutesinger told to the police? In the warrant used in the Aug 16 raid it states that the informant lived at Spahn Ranch a span of about ten days just prior to Aug 16. That could mean Kitty not Sorty. This would account for Shorty Shea's last words, "Why Charlie?" Every rock formation at the former Iverson Ranch has been filmed/photographed hundreds of times. An example is this YouTube vid that shows clearly the distinctive shape of the Lone Ranger Rock both past and present HERE. 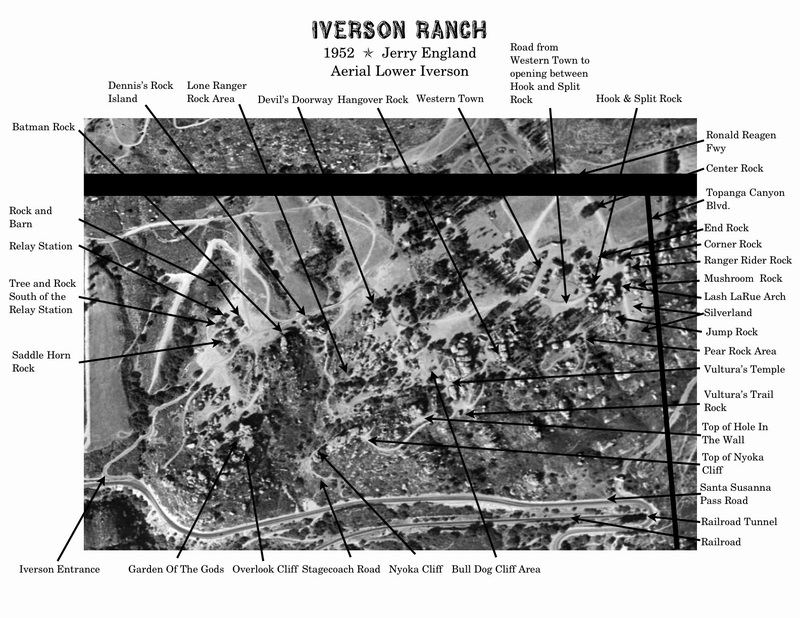 One blogger has studied Iverson Ranch and it's many rock formations, including "Hawk Rock", "Indian Head Rock", "Saddlehorn Rock", "Sphinx Rock", "Buster Keaton's Bathtub", "The Devils Doorway", "Zorro's Cave" and many others, including some bulldozed by the Cal-West housing complex. He uploaded an entire page of pix of the Lone Ranger Rock and surrounding area from many angles HERE.